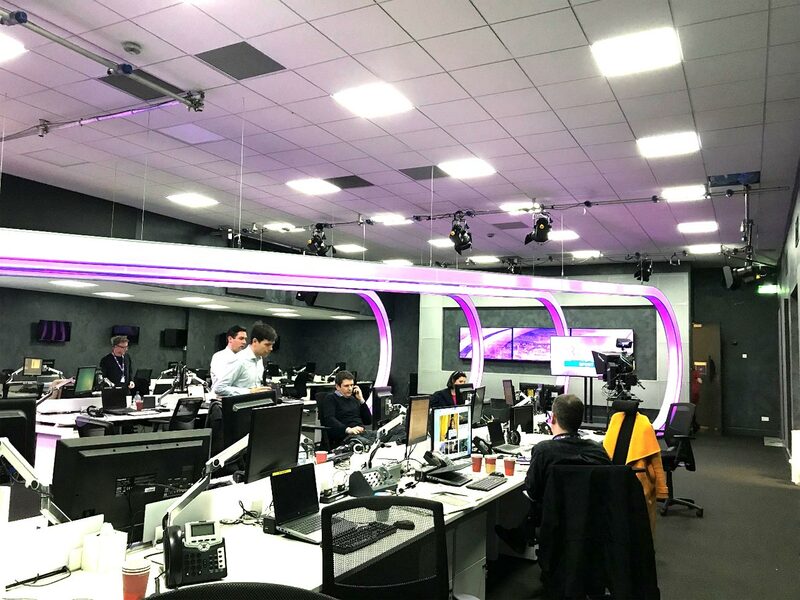 Cine Electric were tasked by High Resolution Lighting Design & TV3 to offer possible solutions for the problem of lighting their new News Room during Broadcasts, without affecting the general operation of said News Room. A solution was found in the Anytronics Any White Tile. Aa 600 x 600 LED Bi Colour LED tile which could be controlled by DMX. Camera test were done, and passed, and 70 of the tiles were retrofitted into the standard suspended Grid Ceiling of the News Room. A stock of Lupo 1000 DAYLED Fresnels were also installed to light both the Sports & Weather stages which are situated within said News Room. Control of the tiles during broadcasts is via an ETC Echo button station which acts just like a light switch ie; On/Off, and then during broadcast the ETC Element takes control and makes the button stations redundant.